I may be a bit (years) behind on the trends, but I just discovered the shared PhotoStreaming ability which Apple offers. I mean, I knew you could share photos but I never thought to use it as a mini-Instagram between family members. I’m sure Android offers the same, but the bulk of our family and extended own Apple products. If you are like me and never knew of this approach, let me indulge you. It is a great way of sharing photos to family, friends, co-workers, farming buddies, you name it. Anything you want to keep exclusive to a certain group of people. You invite who you want and only they can see the stream. It’s incredibly more efficient than group text messages of the latest milestone your young one has met. And it’s more visible and personal than social network blasting. If you are looking to set this up, here is how I did it. 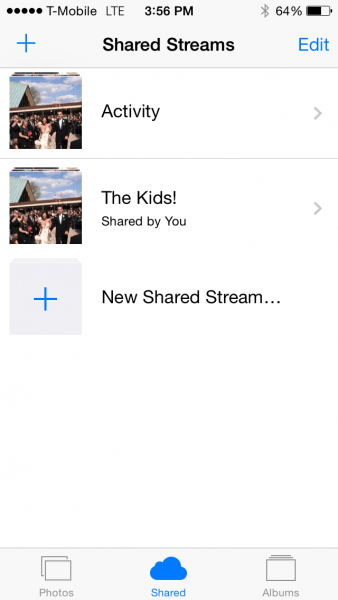 Go into your iPhone, iPad or iPhoto Photos application. Click on the ‘Shared’ icon. Give your PhotoStream a name and the rest is fairly self-explanatory. 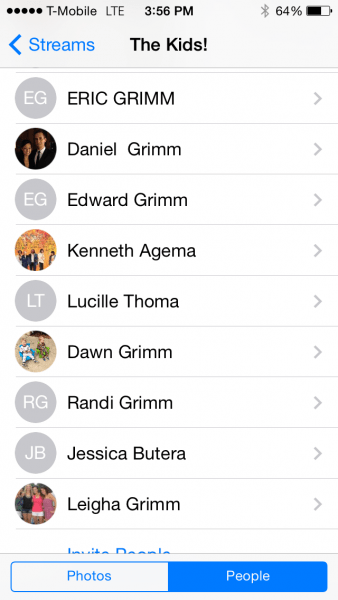 You’ll be prompted to add contacts which integrates directly with your address book for convenience. You can always go back in later and add/remove people from the distribution list. So if Aunt Edna has cleaned up her act, go ahead and give her an invite to the club. I ran into some issues with users running a dated OS version. Others did not having Photo Sharing turned on in their Settings. We have been blasting around photos of the kids and throwbacks for a week now. I tend to shy away from blasting lots of personal pics for all to see on public social networks. So I’m really digging this. Not just for pimping our own kids but seeing our nieces, nephews, siblings and parents photos. We are all busy off living our lives and don’t always make enough time for each other. This is certainly not an acceptable replacement, but it helps with the distance. I only wish we had thought of this sooner. So glad you set this up! Love it!